Another two-tone manicure from me this week! I just have so many colors in my arsenal that are begging to be worn together. 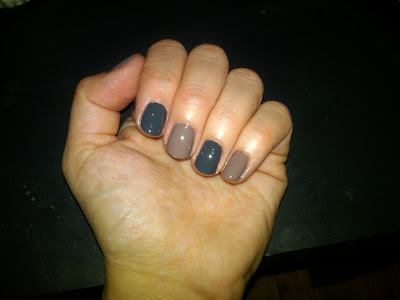 This week I went for Essie Glamour Purse (a creamy almond taupe from the new Brand New Bag Collection) and Deborah Lippmann Stormy Weather (an uber-chic creamy granite that Deborah created with Narciso Rodriguez for his Fall 2011 fashion show). I love the way these two colors look together -- they're severe, sophisticated, chic, refined ... it's a manicure I might just have to do again! I really like experimenting or rather trying different colors on my nails. good thing you have shared this two that could be great as a base color when I got my nail art. Simple yet glamorous.